Where It All Began - The First Panther The Ausf.D was the debut variant of the famed German WWII tank Panther. It offered a complete performance package, with firepower from the imposing L/70 7.5cm gun, excellent protection afforded by its sloped armor, and maneuverability thanks to a roaring 700hp gasoline engine. Around 840 Ausf.D Panthers were produced between January and September of 1943, and the first time it appeared on the battlefield was in the Battle of Kursk in July of that year. While it wasn't all smooth sailing, Panthers were still able to take out some 140 Soviet tanks from a range of 1,500 to 2,000 meters, all the while protected impeccably by their sloped plate. The Ausf.D was followed by improved Ausf.A and G variants, and while the Panther was unable to stop the tide from turning against Germany it nonetheless revolutionized German armored vehicle design, and remained on the front line until the end of hostilities. 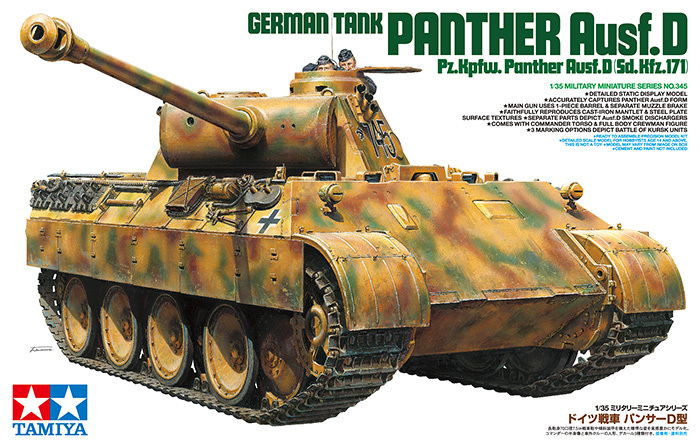 About the Model This is a 1/35 scale plastic model assembly kit of the Panther Ausf.D. Length: 254mm, width: 101mm. The model captures the Ausf.D variant of the Panther with superb accuracy thanks to intensive examination of the final surviving original Ausf.D. Unrivalled precision thanks to depictions of surface texture such as cast metal mantlet and steel armor plating. Intuitive design offers uncomplicated assembly without sacrificing detail. Ausf.D-specific features such as turret-side smoke dischargers are faithfully captured. Features realistic belt-type tracks. PANTHER Ausf. D GERMAN TANK Sd.Kfz. 171. HIGHLY DETAIL MODEL KIT, ACURATE EXTERIOR IN ALL DETAILS. WITH A REALISTIC COMMANDER TORSO FIGURE AND A FULL BODY CREWMAN FIGURE. MAIN GUN USES 1-PIECE BARREL & SEPARATE MUZZLE BRAKE, TAITHFULLY REPRODUCES CAST-IRON MANTLET & STEEL PLATE SURFACE TEXTURES. SEPARATE PARTS DEPICT Ausf.D SMOKE DISCHARGERS. 3 MARKING OPTIONS DEPICT BATTLE OF KURK UNITS. CHOICE OF OPEN OR CLOSED COMMANDER'S AND GUNNER'S HATCH. FULLY DETAILED PLASTIC TRACKS.